Golden wavy ceiling décor pieces accentuate the high ceiling. An “S”-shaped divider wall unit with seats and tables in the middle of the room. 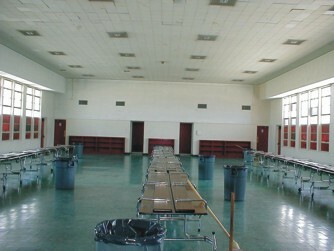 Before: This is a very typical cafeteria design – long folding tables in a long room with boring white walls. After: Golden ceiling décor pieces lower the high ceiling. Colorful booths with glitter metalflake school colors and enclosed trash units beautify the room. 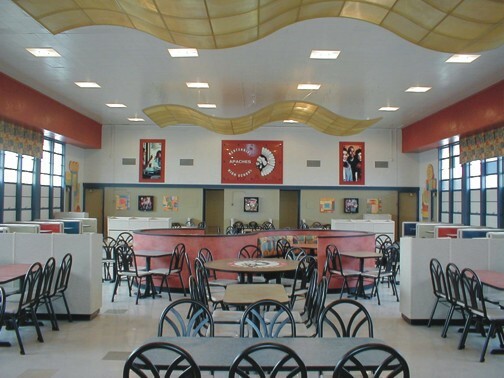 A large “S”-curved half-wall divider unit provides seating and a fast food restaurant look.